The Black Tot comes in a beautiful box complete with a silver-lined 1/2 gill cup and a book about naval rum traditions by Dave Broom. On July 31, 1970 at 11:00 am, the last rum ration was issued aboard the ships of the Royal Navy, thus ending a 300 year-old tradition. This day would be come to be known as Black Tot Day. While the last rum rations had already been given out, there was the matter of the left over rum to deal with, so the remaining rum stocks were transferred from their warehouses in Deptford, Gosport and Devonport to a government bonded warehouse. Here the large oak marrying casks were emptied into wicker-clad imperial gallon stone flagons, and there they sat for nearly forty years, save the occasional pour at state dinners and royal weddings. Naval records indicate the rum was imported to England from Barbados, Guyana, Jamaica and Trinidad in oak casks by E.D & F. Man & Co., rum merchants to the Royal Navy since 1784. While the precise age is unknown, records indicate this rum was likely distilled in the 1940’s. Fast forward nearly forty years, and Specialty Drinks Ltd acquires the remaining stock. Each flagon had a slightly different character, so they blended the flagons and bottled the entire lot at 94.2 proof (those stone flagons did a good job of securing their cargo—almost no alcohol was lost in four decades). 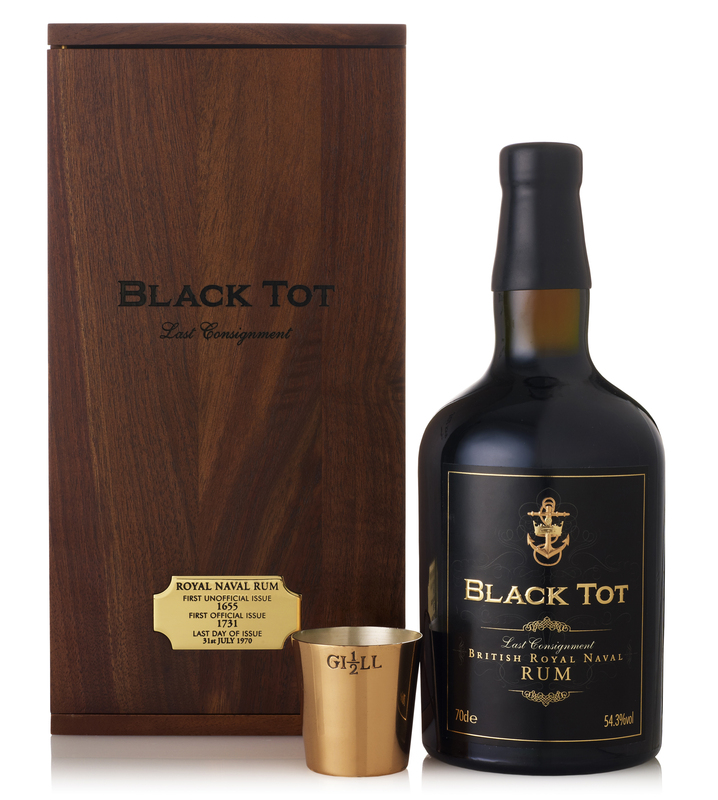 About six thousand bottles were released for sale in 2010 to commemorate the fortieth anniversary of Black Tot Day at a retail price of ~$1,000 per bottle. Given the rarity of the rum, the Black Tot holds a very unique place in the market, so whether or not it’s worth the price is a matter of much debate in rum circles. Does one buy a bottle as a piece of naval history or as a rum? Do you drink it or will it to your heirs? These are the questions you get into when you talk about the Black Tot. I was recently offered a one-ounce taste of the Black Tot by a good friend who has decided to buy one bottle for posterity and another bottle for enjoyment. At about $40/ounce, I would say he is a good friend indeed! The color is a dark mahogany with copper highlights. The viscosity is significant—a swirl generates copious slow moving legs on the tasting glass. The nose is extremely different than any other rum I’ve encountered. Black-strap molasses leads, but is quickly followed by a dark smoke. This is truly a unique beast! The first sip yields an immediate dose of oak and smoked maple syrup. The mouth feel is really interesting and again quite different than other aged rums I’ve tasted. The coating on my tongue and palate is long-lasting and thorough. I can only guess that the effect is due to extended oak contact. The flavors are evocative of a London dock style rum, but one that was left in a dank warehouse for forty years or so. After the oak and smoke die down, I can detect plum and black currant. There is also a very odd undertone that is reminiscent of soy sauce. After the dark soy, the fruit continues with a hint of tangelo, after which the spice notes kick in. Black pepper and a hint of allspice are present here. The long finish is dominated by the smoke and oak, however, with a prominent note of cigar tobacco. I feel really privileged to have tasted the Black Tot, and I can’t thank my friend enough for the taste. That said, I’m not a fan of this rum on its own merits. Is it an extremely cool piece of naval and rum history? The answer to that question is of course a resounding “yes”. Conversely, if I close my eyes and pretend this is a brand new rum on the market and ask myself if I like it, the answer would have to be “not so much”. The reason to buy this rum is to own a piece of history, and for that reason, I fully support its purchase. I would even advocate for buying a taste at a rum bar. As an important piece of history, any rum aficionado owes it to themselves to taste it. A pour of the Tot will cost you a pretty penny, but it will be less than 90% of the full bottle price. If you’re in the San Francisco area, you can buy a taste at Smuggler’s Cove. If you’re looking for a full bottle, buy online here. Have you had a chance to taste the Black Tot? What did you think? Do you think you would have enjoyed it as much if it was tasted blind along side other rums? Please share your comments below. Great review Josh! What were your final thoughts on the Black Heart as a budget friendly Black Tot alternative? Thanks, Paul! The Black Heart was a decidedly different animal. Although dark and robust, it didn’t carry with it the oaken baggage of the Black Tot. I would have to sit down with it and compare against other rums in real time, but while I’ve definitely had others reminiscent of the Black Heart, I can’t say the same of the Black Tot. If there *is* an alternative to the Black Tot out there, I would have to assume it’s a historical rum, not something aged less than twenty or thirty years. I wish I had taken better notes when I tasted it at Tales of the Cocktail. Eric Seed took out a flask and poured a few of us some and then told us the story as we tasted it. I had no clue what the price was at that time for he hadn’t launched the product stateside. And I wasn’t writing anything down at that moment. I seem to recall this being at the Tuesday tasting event before Tales officially started which would mean that it was at least served to me in class instead of a small plastic cup. Yes, Black Tot in a plastic cup would be a travesty! There have been some travesties at Tales in regards to fine spirits served in the same plastic cups as everything else. The most memorable one was a rare, old, and expensive Armagnac — I remember leaving the seminar and sipping on it on the way out to the street since I didn’t want to leave it behind. Although sipping Armagnac in 95 degree NOLA weather isn’t optimal. Josh you are the man, and I’d gladly give up a small body part to have been in your place and to be able to taste history. Thanks for your impressions on what rum really tasted like for the couple hundred years the daily tot was part of the British Royal Navy tradition. Just one little observation though. When you say “The coating on my tongue and palate is long-lasting and thorough. I can only guess that the effect is due to extended oak contact.”, please keep in mind that as of that day (1970), the remaining stocks were transferred to stone flagons and like all bottled spirits, the oak effects stopped at that time. Thus there would be no extended oak effect. Rather, what you tasted is what they tasted in 1970, a blend that went back to at least 1830. Thus you are tasting what untold thousands of British sailors and officers treasured, to this day. Next time call me please, won’t you? Again, thanks. The Pusser’s guys have the “recipe” you could snag a bottle of their more aged offering and pretend, but I couldn’t tell you how it compares to the real deal. MY WIFE SURPRISED ME WITH THE BLACK TOT ON MY 80 TH. BIRTHDAY ! EXACTLY ONE YEAR AGO TODAY ! MY ” TEAT ” PIPETTE DROPS A SMALL AMOUNT ON MY TONGUE FROM TIME TO TIME AND I’M IN HEAVEN ! BOTTLE IS ALMOST EMPTY ! KIND , KIND , KIND ! BUT I’M NOT SHARING ! I tasted it the first time at the Tales but in extrememly small quantity, what i remembered the most from that was a very long finish.Now i tried it again at the UK Rumfest at Martin`s seminar about navy rum and we toasted together with members of the Royal British navy. I like it bec personally i like those heavy types of rum. I find it woody, “old”, thick, mature….your review is spot on i think when it comes to the flavor descriptions. I think you literally taste a piece of history in that glass.A good rum in my opinion. Thank you for this interesting review. I served in the Royal Navy for 11ys and drew my daily tot for 3yrs until it finished in 1970. The rum was issued daily, in bulk, to each messdeck and the pipe ‘Up Spirits’ at 1130am, signified the start of the daily ritual. It was only issued to ratings (not officers) Seniors rates (CPOs and POs) received theirs neat, whilst entitled junior rates had theirs mixed with two parts of water (Grog) This was supposedly to reduce drunkenness and prevent it being bottled by junior rates. All ratings over 20 were entitled and it was also a lower deck currency. The going rate for someone to stand in for your duty was 1/2 tot. Very rarely would a whole tot be given away. The closest affordable rum to the original is Pussers Gunpowder Proof, which is made to the original recipe and the same strength (and a fraction of the price of Black Tot) My own preference is to mix a tot of neat rum with an equal amount of water (1&1) Respect this rum as it is extremely strong but a great start to a night out. Awesome…drinking history is more than worth the price. I once drank aboard an Australian navy ship, invited by some mates and the rum we had tasted even better anchored off Waikiki on such a magnificent ship. My bottle of Black Tot awaits a few more years to celebrate 50 years of the doing away with the tradition. I hope The Queen reinstates the privilege! Therefore, for those holding such a bottle hold on to it, buy up one (start a piggy bank) and enjoy!